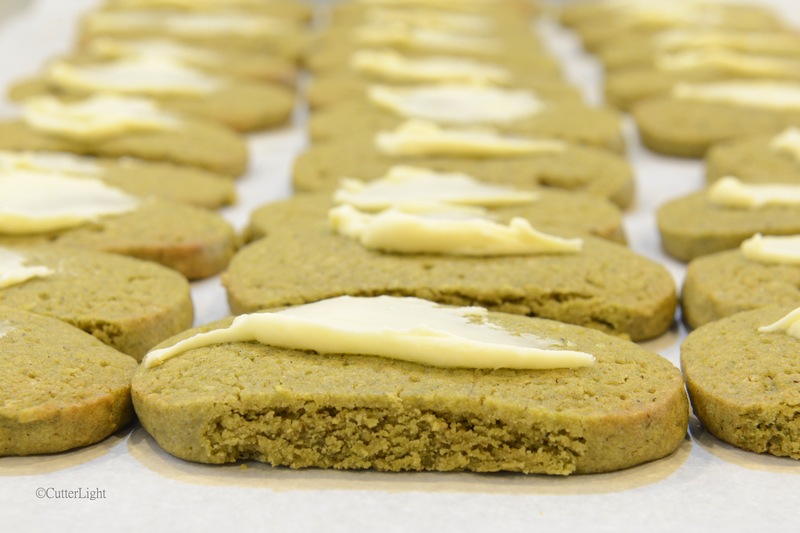 The light texture with the rich, complex flavors of matcha and almond put this cookie into the “favorites” category of my recipe file. The tin of matcha green tea powder in my pantry continually inspires ideas. The powder is easy to use and has a distinctive flavor. I’ve made mini matcha cheesecakes, matcha butter cookies, and even matcha flavored ice cream. At this time of year, Jack always requests Russian tea cakes. He has fond memories of these delightful cookies tied to both Christmas and his grandmother. I thought I would create a recipe combining the texture and look of the traditional Russian snowballs with the inspiring flavor of matcha. This recipe is not shy on flavor. The small cookies give two bites with the pow of almond and the zip of matcha. Mix butter, water, egg and extracts together in a small bowl. Sift together matcha tea powder, powdered sugar and flour in large bowl. Stir almonds into flour mixture. Stir butter mixture into flour mixture. Mix until dough forms. Add additional water if mixture is dry. Let dough chill for 30 minutes in refrigerator. Line baking sheet with parchment paper. Preheat oven to 325 degrees F (160 degrees C). Using a cookie scoop or a tablespoon, scoop out dough and shape into balls. Bake on baking sheet for 20 minutes. Cookies should be lightly browned on the edges when done. Roll cooled cookies in powdered sugar. The look of these delicious green cookies may remind you it is Saint Patrick’s Day, but the flavor will inspire thoughts of Japan. In a large mixing bowl, sift together flour, baking soda, matcha powder and salt. In a separate bowl, mix together butter, sugars, eggs and milk. Roll dough into two 2-inch (5 cm) logs. Wrap logs in plastic wrap. Refrigerate wrapped dough for at least 60 minutes. Cut dough into 1/4 inch slices. Place slices of dough on a parchment-lined baking sheet. Place cookies about an inch apart. Bake cookies for 8 – 10 minutes. Edges will just begin to brown. Cool slightly. Then finish cooling on wire rack.